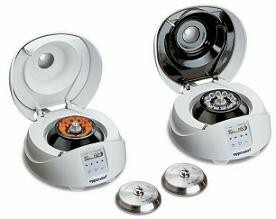 The unique cross-over Eppendorf 5430 and Eppendorf 5430 R centrifuges combine the best features of a microcentrifuge (small footprint) and multipurpose centrifuge (versatility) in one instrument. With a maximum speed of 30,130 × g (17,500 rpm), these centrifuges spin rotors for Eppendorf tubes, microtubes, PCR strips, or microtiter plates. With its compact size, the Eppendorf 5430 and Eppendorf 5430 R centrifuges also accommodate rotors for microplates and 15/50 mL conical tubes. Now, the rotor program has been expanded to include additional Eppendorf QuickLock® rotors. This includes 48-place rotors (1.5/2.0 mL), a 16-place rotor for Eppendorf Tubes® 5.0 mL and a swing-bucket rotor (24 × 1.5/2.0 mL). The Eppendorf 5430 R refrigerated unit has a temperature range of -11 °C to +40 °C. Both the Eppendorf 5430 and Eppendorf 5430 R are available in either a keypad or knob interface format. 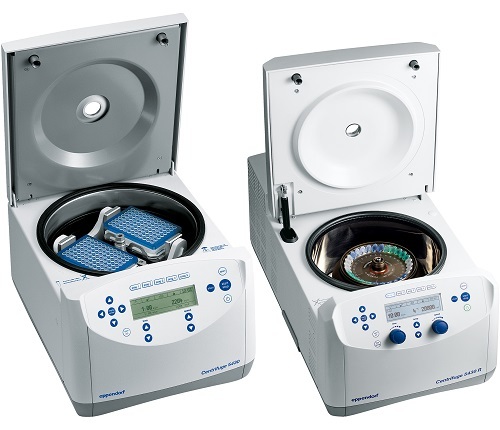 With their unmatched versatility, the Eppendorf 5430 and Eppendorf 5430 R centrifuges are the flagship products among the Eppendorf microcentrifuge portfolio. 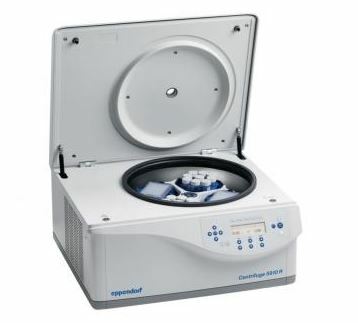 The refrigerated Eppendorf Centrifuge 5910 R combines high capacity and performance in a compact and ergonomic product design. It comes with a modern user interface and an advanced temperature management system. 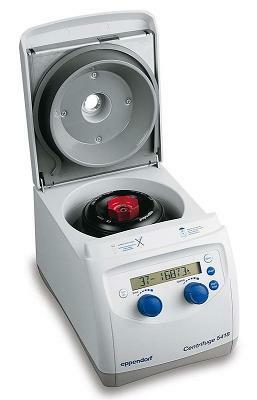 Centrifuge 5910 R combines a high capacity of up to 4 x 750 mL with extraordinary versatility. Its main swing-bucket rotor holds both conical tubes and plates – no need to change rotor buckets or adapters. This improves handling and saves time. It features a powerful state-of-the-art refrigeration system with advanced temperature management to keep your samples safe.